Indians Baseball Cards: A-Rod, Jeter, Rivera, Junior, Ichiro - Oh My! Hey, great pics. Are you home now? And, were you rooting for the Yankees? If so, please explain yourself. New York is great isn't it? I'm going for a weekend in about a month. Unfortunately there will be no ballgame for me. Glad to see a blogger not hating the Yankees for a change. I'll be going to Friday's game - hopefully no rain this time. And no, that wasn't me working late, fortunately! But Bo, if we don't hate the Yankees who are we supposed to hate? 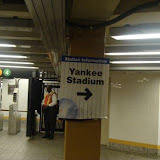 I saw my first game at Yankee Stadium. The Yankees lost. I saw my second game at Fenway Park. The Red Sox won. That was a great start for me. Unfortunately, the Dodgers have lost the only game I've seen them in person. Glad you're enjoying your trip! NY is a great city. After a slow start, the team is starting to click nicely. Wonder what trades they will make in a few months as they prepare to win another World Series.